Microsoft's E3 2013 press conference will primarily be about games, not TV and sports for the Xbox One, according to the company. "I can confirm that we will have TV's (or similar) on stage to show the games. That should be the extend [sic] of TV talk in your #E3," tweeted Larry Hryb, director of programming for Xbox Live. Hyrb, better known by his gamertag handle Major Nelson, was responding to a follower's snarky comment that repeated the word "TV" 22 times in a single 140-character message. Microsoft has been roundly criticized for Xbox One's unveiling on May 21 in Redmond, Wash., where the next-generation console's entertainment features took center stage. Xbox One had nifty features like Live TV, Halo TV, fantasy football, and instant switching and Snap Mode, but only a few games were shown when Microsoft announced the console. 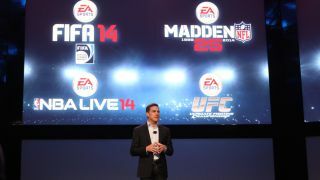 Microsoft Game Studios' one in-house title was Forza Motorsport 5, while EA Sports announced the very obvious sports entries FIFA 14, Madden NFL 25, NBA Live and UFC. Call of Duty: Ghosts was confirmed for Xbox One, and will come with timed-exclusive downloadable content, just like the Activision franchise did on Xbox 360. The only new IP announced that day was Quantum Break from third-party developer Remedy Entertainment, also known as the developer of the first two Max Payne games. Going along with Hyrb's comments, GTTV host Geoff Keighley tweeted that Microsoft and Sony video game fans are in for E3 surprises. "10 days until E3. Based on what I'm hearing both the Xbox and PS4 press confs will be the strongest in years. Lots of games and surprises," wrote Keighley. We have certainly heard this before on the Sony side from PS4's lead architect Mark Cerny. "The launch lineup for PlayStation 4 - though I unfortunately can't give the title count - is going to be stronger than any prior PlayStation hardware," Cerny said in April. Microsoft may also have enough Xbox One surprises to win over turned-off gamers. The question remains whether or not the company can appease those worried about still-lingering always-on Xbox One questions and used game restrictions at E3 2013. PS4 showed off more games but find out if that's enough to win the Xbox One vs PS4 debate.